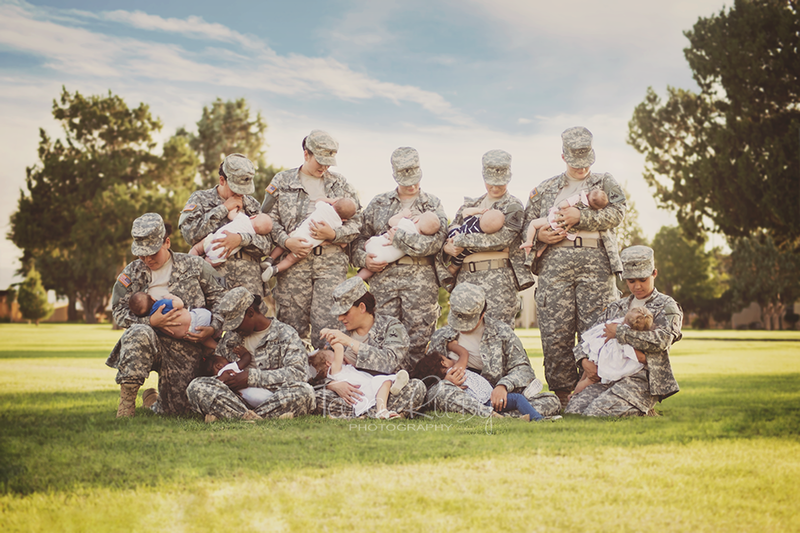 Photographer and former Army solider Tara Ruby has been trying in earnest to share this powerful image, captured of 10 active duty moms in uniform breastfeeding together at Fort Bliss, the Army post near El Paso, Texas. Ruby posted the photo to her business’s Facebook page one evening, only to find in the morning that it had mysteriously disappeared. The bold photographer reposted the photo, and it’s since gotten a lot of attention from advocates of public breastfeeding and supporters of female active duty personnel. Ruby believes that this photo is a first. In her Facebook post, she wrote, “To my knowledge a group photo to show support of active duty military mommies nursing their little’s [sic] has never been done. It is so nice to see support for this here at Fort Bliss.” She points to the role of breastfeeding and motherhood as something that makes these women better at their jobs. “Breastfeeding their babies doesn’t make them less of a soldier, I believe it makes them a better one,” she wrote. “Juggling the tasks and expectations of a soldier, plus providing for their own in the best way they possibly can, makes these ladies even stronger for it.” Nurse on, military mamas.